In The Force Awakens and the larger new Expanded Universe, characters are being drawn together again with connections, but this time it’s different. This time, it’s a pivotal event in the history of the Star Wars universe – the destruction of the Second Death Star and defeat of Emperor Palpatine (and his henchman Vader) at the Battle of Endor. The release of the first issue of Marvel Comics’ Poe Dameron drove this point home with the character of L’ulo, a Duros alien, who is a member of Poe Dameron’s elite Black Squadron. Don’t recognize the name? That’s not surprising unless you have been following Marvel’s Star Wars comics and then, specifically four part series Shattered Empire. Shattered Empire was one of the first pieces of the new Star Wars Expanded Universe which revealed the aftermath of the Battle of Endor. In fact, that battle is the starting point of the series, introducing Shara Bey and Kes Dameron, the parents of Poe Dameron. Shara is an A-Wing pilot, a member of Green Squadron who thankfully doesn’t blow up the Imperial shuttle Luke pilots out in the nick of time before the battle station blows up. A surviving member of Green Squadron is L’ulo, who becomes Shara’s commander after the terrible casualties the Rebel Alliance suffered in the battle. He fades into the background of the short series, a supporting actor, so to speak, and presumably forgotten as the story of Star Wars continued onward. Surprisingly, L’ulo’s character, along with his A-wing, was resurrected decades later to fly with Poe Dameron. We also have Snap Wexley, who had a few speaking parts in The Force Awakens as a member of the same squadron. How does the Battle of Endor connect these three individuals? 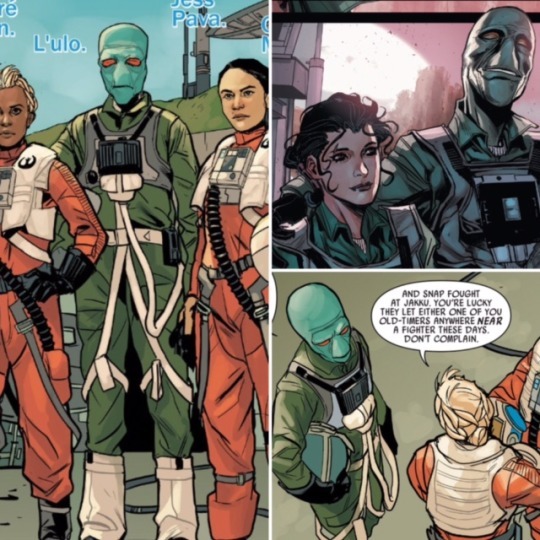 As we pointed out, L’ulo is a veteran of that battle and Poe Dameron’s parents both fault in that battle. So what about Snap? Snap’s real name is Temmin Wexley, and he was introduced in Chuck Wendig’s Aftermath novel. His mother, however, Norra Wexley, was, wait for it, a Y-wing pilot at the Battle of Endor. For those keeping count, she pilots a Y-wing that flies into the Death Star’s superstructure with Lando Calrissian, Wedge Antilles, and Nien Nunb. Aftermath takes place not long after the Battle of Endor when Norra decides it’s time for her to return home to reclaim her son, who she had left in the care of her sister. Thus, these three characters in Poe Dameron’s comic all have connections to the Battle of Endor. Obviously, the original stars of Star Wars, Luke, Leia, Chewbacca, and Han, were participants in the battle. The same is true for R2-D2 and C-3PO. All of these characters reappeared in The Force Awakens, but there’s also a couple other characters introduced in Return of the Jedi who also have that Endor connection. 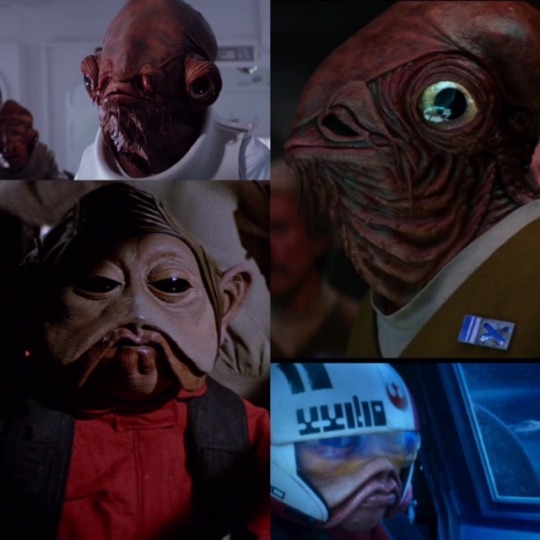 The aforementioned Nien Nunb, now in the role of X-wing pilot, personally played a role in the Death Star’s destruction, and the space battle itself was overseen by Admiral Ackbar, the Calamari hero who left retirement to join General Leia Organa in the war against the First Order. On the First Order side, the connections to the Battle of Endor appear to reside in one individual, Kylo Ren. The head of the Knights of Ren was born sometime after the battle, but of course, his parents were both on that forest moon. 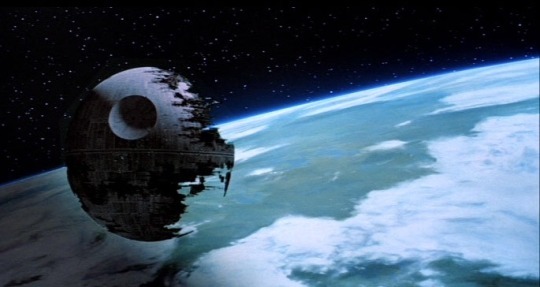 Of course, the comparison of the Starkiller Base to the Death Star provides a kind of technological spiritual connection between the Galactic Empire at Endor and the First Order. In terms of the new slate of Star Wars novels released as part of the new Expanded Universe, we already touched upon Chuck Wendig’s Aftermath concerning the Wexleys, but there are other characters as well, such as Sinjir Rath Velus, who was present on the forest moon during the battle and takes the opportunity to desert the Empire in the wake of the defeat. 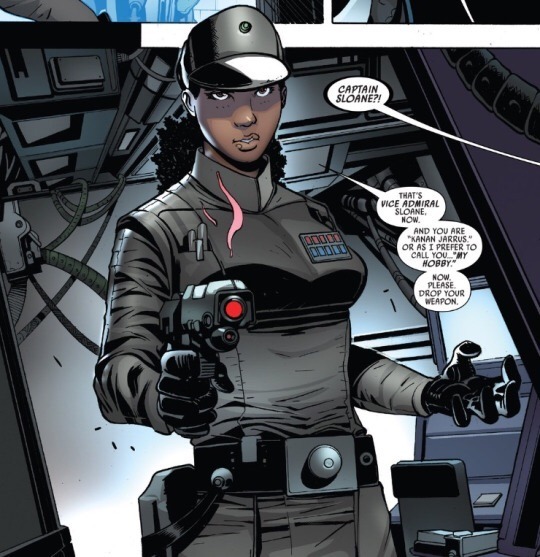 Then we have one of the new key connecting characters of the new Expanded Universe, Rae Sloane. First introduced in the pre-Original Trilogy set A New Dawn by John Jackson Miller, Sloane is a captain of a star destroyer and an antagonist to Hera Syndulla and Jedi Kanan Jarrus (remember those names). In Aftermath, Sloane is an admiral and the chief Imperial character in the novel, and also a veteran of the losing side of the Battle of Endor. In this manner, she pulls A New Dawn into the web of stories somehow connected to Endor. Another novel, likewise pulled by connection to a character to Endor is Battlefront: Twilight Company, which brings such characters as Nien Nunb and Darth Vader, despite being set prior to Return of the Jedi. Arguably, every published addition to the new Star Wars Expanded Universe can in some form be traced to the battle. Not even the canonical Star Wars animated shows, The Clone Wars and Rebels escape this connection. Both shows feature a clone named Captain Rex, and just recently, Dave Filoni has all but confirmed as official the retconning of Rex into Return of the Jedi as an unnamed rebel soldier with a white bushy beard in the battle on the forest moon. Likewise, two characters on Rebels have had a brush with someone who has a definite connection to the battle, Hera Syndulla and Kanan Jarrus. Not only do they know Rae Sloane from A New Dawn, but Kanan encounters Rae Sloane later in Marvel’s Kanan series. The Clone Wars also featured Palpatine on his rise to becoming the Emperor through the shady machinations of Darth Sidious, and who, of course, meets his end during a certain battle. Casting our eyes to the newest cinematic entry to come, Rogue One, we already know from the trailer released today that it features Mon Mothma, whom we first met in Return of the Jedi and who actually opened up the preparatory meeting concerning the plans for the upcoming battle. In the end, what does it mean that a surprising number of characters in The Force Awakens universe and the new Expanded Universe have ties to the Battle of Endor? Not much, not much at all, but it does make a bit more sense than the previous reasoning simply being it’s a small galaxy where everyone just happens to run into everyone else. Why it makes sense is that the Battle of Endor is a monumental moment in the history of the galaxy. Virtually every resource between both sides in the battle, the Rebel Alliance and the Galactic Empire were involved in what everyone believed would be the decisive battle of the Galactic Civil War, and as almost all our stories exclusively revolve around either A) the beginning of the Empire (Prequel Trilogy era), B) the fight against the Empire (Original Trilogy era), and C) the aftermath following the fall of the Empire (Sequel Trilogy era), it makes sense that almost all of the characters we meet can somehow find a connection, be it directly or indirectly, back to this defining battle. It’s a bit more logical, a bit more realistic, and significantly less likely to result in hair pulling.